The Centre for Global Development (CGD) have published their Commitment to Development Index for Africa, which looks beyond development assistance funding to gauge rich countries’ engagement with Africa. 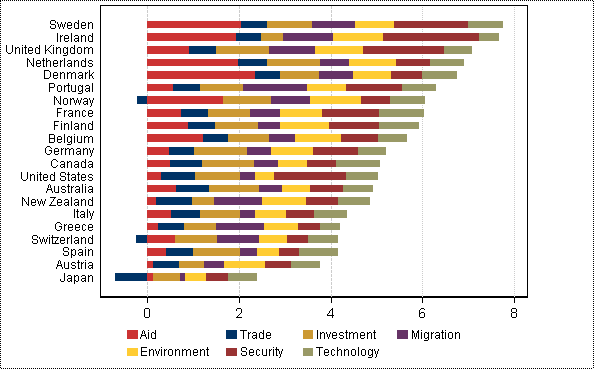 The summary chart below is based on the average of country scoring (0-10) across seven policy areas. The index builds on the CGD’s global index – – indeed the investment, environment and technology policy areas are the same, which to some extent undermines their usefulness in the CDI for Africa. Other quibbles might include, inter alia, the lack of linkage between the policies and actual growth and/or poverty reduction, (i.e. what has been the impact of investment policies? ), the narrowness of the environmental indicators (forestry is reduced to tropical timber imports; the US scores 0 for not signing up to Kyoto, but gets no credit for implementing the Clean Air Act), the UK scores well for intervening in Sierra Leone, but does not appear to lose much for supplying arms and munitions to the continent. Such indices are inherently subjective, but the CGD is exemplary in providing both the technical briefs which describe the methodologies used to derive the scores, and a spreadsheet file containing the data, calculations and data sources. The results show the disparities in rich countries’ committment to development in Africa – in spite of signing up to initiatives such as the millennium development goals and debt cancellation. Even top-placed Sweden scores less than average (5) in four policy areas. It would be interesting in future editions to include emerging economies such as China, India, & Brazil in the index to measure the quantity and quality of their aid, trade agreements and other support to the continent. British arms export sales — a record £10bn — amount to a third of all worldwide export orders for military equipment.